Originally bred to rescue travelers and to guard travel lodges in the Swiss Alps, the Saint Bernard is a gentle, intelligent, muscular dog. The breed is often used as mascots and has even starred in movies like Beethoven. Despite the breed's giant size, they prefer being indoors with their family. This can be a love hate relationship as Saint Bernards are very friendly, easy going, and are generally happy to lie down and sleep while their family does their thing. However, the breed is known for their lack of cleanliness as they shed, drool heavily, and oftentimes track dirt and mud. The Saint Bernard is considered a giant dog breed and rightly so! Saint Bernards can often weigh in excess of 180 pounds and be as tall as 30 inches from ground to shoulder. The size and appearance of the breed today is likely a result of careful breeding by monks to create a dog with the best physical characteristics for protection and rescue in the Alps. Saint Bernards are known as friendly companion dogs. They should never be shy nor aggressive, but will step up if the moment arises and their family needs protection. The breed does well with children, but due to their large size they need to be supervised as the giant dogs can easily knock over a child unintentionally. The breed also does well with pets and is generally calm and benevolent. 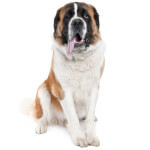 Saint bernards will need to be brushed a few times per week to keep their fur from matting and to minimize shedding. The breed's coat keeps itself clean so they don't need to be bathed frequently. Saint Bernards are prone to obesity, so they need moderate exercise to keep them healthy. This can be reached with a 20-30 minute daily walk. Saint Bernard history is as shrouded in mystery as the deadly snowstorms of the region from which the breed emerged. 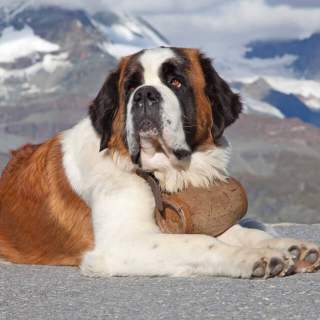 It is thought that the Romans took large Asian molosser dogs into the Swiss mountain pass around 100-200 A.D. Those dogs naturally mated with native dogs and this is thought to be where Saint Bernards are from. During that time, Roman emperors saw to developing the pass, making it highly protected, and building a temple to Jupiter at the top. This building also served as a waypoint for travelers, for it was a fatally harsh environment. For several centuries, however, the dog was not noted. First came a painting by Salvatore Rosa around 1690, and then, early in the following century, the first known written record was recorded. Toward the end of the 18th century, the dogs started to be recognized by other artists who wrote home as well as painted the dogs. In the early 19th century, the near-extinction of the breed seemed to have prompted people to recognize the dog's vast importance in saving lives. The winter storms that took place between 1815 and 1820 resulted in a great many of these dogs dying while attempting rescues. Just prior to that, the most famous Saint Bernard, Barry, performed his legendary work from 1800 until 1812, when he died. During that period, he was said to have saved at least 40 people. Around the time the winter storms were starting to take their mortal and canine cost in 1815, Barry was enshrined at the Natural History Museum in Berne, Switzerland. His body remains there to this day. After the first great and cruel set of storms of the century, monks started cross-breeding the dogs with Newfoundlands. The belief was that the longer hair would better protect the dogs. Instead, it led to quicker and more possible death, for the considerably longer hair would freeze through with ice. During this time, the dog remained without a formal name. They were called, variously, Alpine Mastiffs, Holy Dogs, Hospice Dogs, Monastery Dogs, Mountain Dogs, Saint Bernard Mastiffs, and Swiss Alpine Dogs. Some even called them Barry Dogs in honor of that great Bernard in the sky. 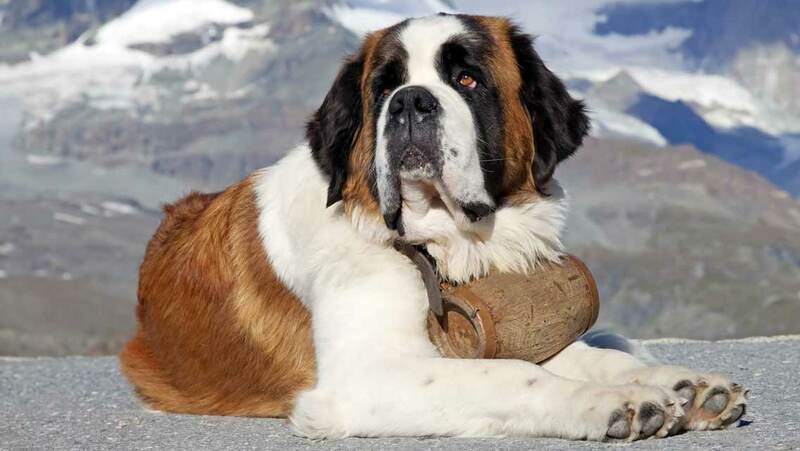 It was not until 1880 that the name Saint Bernard was universally applied. Soon thereafter, the first club was started: the Swiss St. Bernard Club in Basel (Switzerland) in 1884. One year later, in 1885, the AKC formally recognized the dog. It took another four years, to 1888, before a breed standard was accepted. The dog's original usefulness was waning, however, and the last recorded rescue was in 1897. During the 200-plus years that the breed's rescues were recorded, some 2,000 people had been successfully rescued by them. As for the St. Bernard keg history? More about that legendary myth may be found elsewhere on this page, under the other notes. Although impressive in size, the Saint Bernard is clearly a lovable-looking dog and one that doesn't lend to fearsomeness. This is an,overall, sturdy breed with a thick coat of hair — even those of the short-coated variety — and a much longer body than the dog's height. 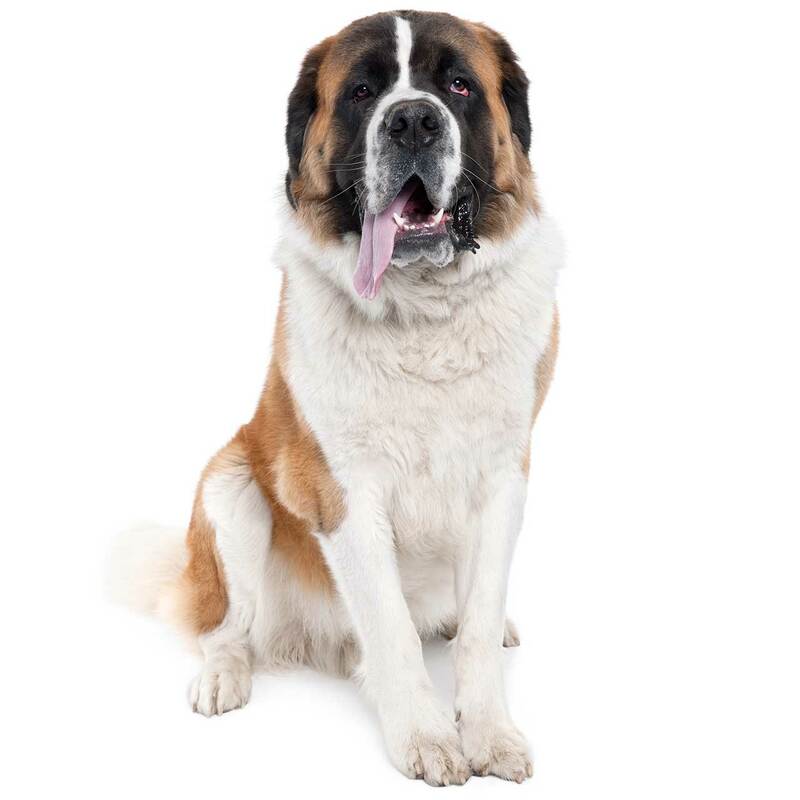 The massive Saint Bernard face and head is book-ended by large, forward-flapping, floppy ears, and it will usually feature a large, drooling tongue hanging out of the broad muzzle. Although most every other facial feature tends to be large, the St. Bernard eyes are medium in size. The strong neck connects an ample body that should be lean rather than large, long legs ending in medium-size paws and a medium-length, bushy tail. If you are looking for a black Saint Bernard, however, you will not find one. There are plenty of look-a-like breeds that are mistaken for black as well as white Saint Bernards: Bernese Mountain Dogs, Newfoundlands, and even Tibetan Mastiffs. 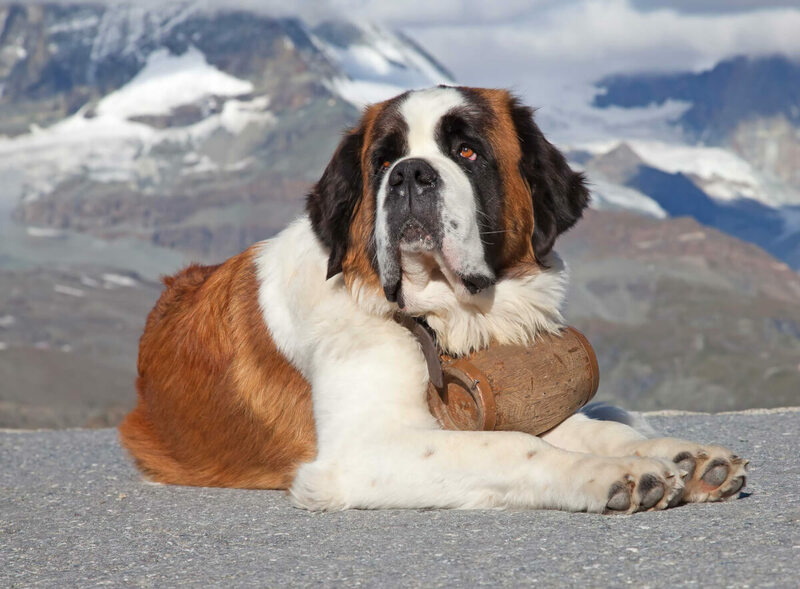 Make sure you know the Saint Bernard and the various mountain dogs before believing that you are seeing an all-black or all-white Saint Bernard. The Saint Bernard size is legendary, and while these dogs were not always this gigantic, how big a Saint Bernard will get is the forefront question on every owner's mind. Today's breed tends to be from 25 up to 28 inches in height; fully grown, Saint Bernards' weight tips the scales from 110 pounds to a scale-breaking 200. The puppies alone typically weigh more than a lot of small dog breeds. 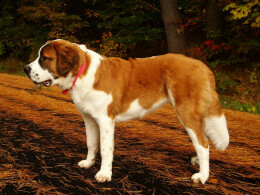 There are only two variations of this breed: short-haired Saint Bernards and long-haired. Prior to 1830, all were short-haired, and it was a brief (and fatally fruitless) experiment in cross-breeding the dog with Newfoundlands that produced the long-haired variety. Both are commonly found wherever there may be Saint Bernards. 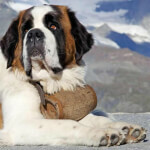 The Saint Bernard is one of the biggest dog breeds so purebred Saint Bernards range from big to huge-- to giant! 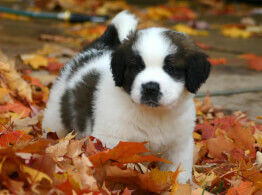 As for a Petit St. Bernard (or similarly named "breed" prefix such as Micro, Mini, etc. ), there are no purebred dogs of this name. There are a lot of crossbred dogs that have Saint Bernard in them — as well as other bloodlines. 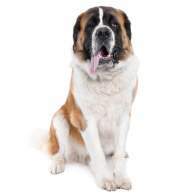 The St. Bernard temperament is a relatively gentle one. These dogs seem to know their strength, and as such their key characteristics are calm, easy-going and quiet. Should there be a close and obvious threat, they can more than muster what is needed to protect their family, property, and self. They do need a lot of attention, however, as they are used to having their way. Unlike the Saint Bernards you may have seen in movies, there are no off-screen trainers and handlers to make sure the script runs smoothly; there's only you and your family. All of you should understand what these dogs need. While they can make good family companions and playmates for old-enough kids, they do require a lot of patience in many ways. They don't need much exercise, they prefer to be indoors, and they are difficult to train. House-training is typically easier than most other things. These dogs have a habit of eating as much as you'll give them. This will lead to a variety of health and possibly life-threatening ailments, so you must know how to keep them properly fed. Being as big as they are, what may be cute behavior for small dogs can easily be annoying — if not vexing — as part of the St. Bernards personality. This can be especially true in public when belligerent antics can lead to injury, property damage and legal complications. Most people have seen this breed in movies and wonder "Are Saint Bernards good family dogs?" A St. Bernard with kids is usually not bad. If you have older, larger kids, it should be much easier for them to understand how to live with such a huge dog. They can be problematic with younger kids unless they have grown up with them, are socialized properly, and the kids know to respect the dog. As for a Saint Bernard with a baby, it is not at all recommended. Both the dog and baby will have to be watched at all times. Even with extremely friendly Saint Bernards, a baby can be endangered by the sheer size of the dog. Because they seem like lovable dogs that are perfectly calm no matter what (when not being frisky in a funny way), St. Bernards and cats may be thought to get along just fine. Fortunately, these dogs mingle nicely with cats as well as with other dogs. It's best they be socialized, and perhaps highly advisable that when at the dog park, they stick with dogs their own size too. Some people say that when Saint Bernards play, they can forget their size, their strength, and the distinct possibility that they can easily step on small dogs. Below are pictures of the Saint Bernard dog breed. They are cute and lovable-looking, they seem clownish on the big screen, and you may even have a humorous idea that very small children can ride them. All of these perceptions should be set aside to understand the daily reality that will quickly set in if you are thinking of owning a Saint Bernard. They tend to not bark very much, but they can easily develop separation anxiety. If they are very friendly, they may be annoying to friends and visitors. If they are aloof, they may prompt fear, which will not end well if not managed immediately. St. Bernards as pets require a lot of cleaning and grooming as well as sometimes accepting a far-from-clean house: drool, dirt, and hair will often cake your floor, furniture, and clothes. They tend to adapt well enough to apartment living, and they are definitely inside dogs, but you'll need to take them outside, and they don't seem to mind getting dirty rather quickly. They will shed a good amount between the two annual coat blow-outs — and then they will really cover everything with hair. They are not hypoallergenic, and people with allergies will not fare well with Saint Bernards. Perhaps the one thing that most everyone has heard is the St. Bernard keg of brandy. This famous rescue dog's draught of brandy, whisky, benedictine or whatever is repeatedly rumored to have been inside), was a myth. Although the dog did indeed carry supplies to aid those lost in the snow, such supplies did not include the reanimating magic that was first featured in an 1820 painting by Sir Edwin Henry Landseer. This famous portrait, titled "Alpine Mastiffs Reanimating a Distressed Traveller," has had no less a lasting effect than the early- to mid-1990s Disney movies about a Saint Bernard named "Beethoven." Saint Bernards are very big dogs, and some say they are bigger than they should be due to experimental cross-breeding and a long-ago closed stud book that prevented correctional cross-breeding before a standard was accepted. And like all massive dog breeds, there are certain problems that are highly likely such as joint dysplasia, back problems, and bloat. There are also concerns of cancer, eye ailments, diabetes, seizures, heart conditions, thyroid complications, and skin allergies. These are not easy dogs to keep healthy, but if you are prepared for the huge responsibility, then your Saint Bernard should live to be 8 to 10 years old.